Yes, I’ve been in Cornwall! I took my elderly parents down there for a few days holiday and for a chance to see my mother’s family again. With my mother being unwell, we wanted her to have the chance to see her folks one more time. My mother was one of eight children so she still has an assortment of sisters, cousins, nieces and nephews down there. If you read my blog from two weeks ago, you’ll know that my mother is very poorly now and so we were relieved she had a chance to see her close family again. Anyway, I took the opportunity to fit in a parkrun in a different part of the country and so on Saturday morning I headed off to the Eden Project. If you’ve been watching Poldark you’ll know that mining was a vital part of the Cornish economy for several centuries. The geology of Cornwall seems to be slightly different from other parts of Britain and once was a rich source of copper and tin. The mining industry gradually declined as the reserves dwindled and the last tin mine at South Crofty was closed in 1998. There is talk however of some mining being restarted because there are other minerals down there which might be of value e.g. lithium for batteries. 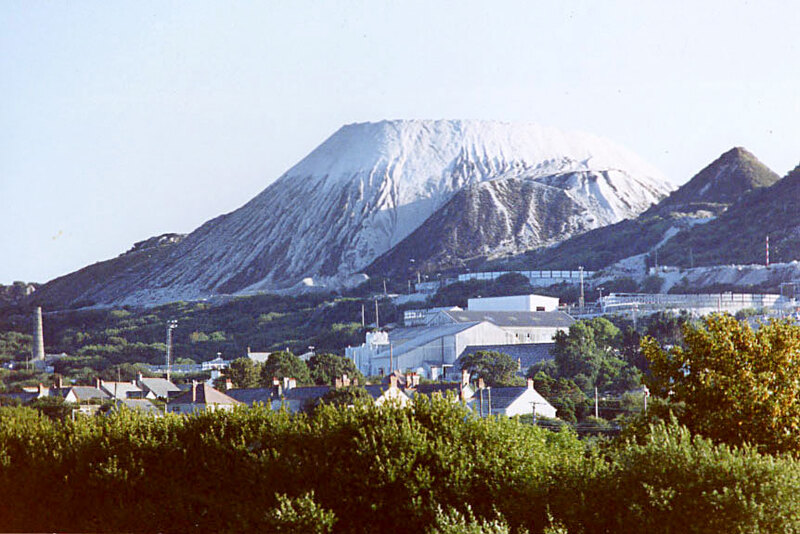 The other major product to come out of Cornwall was china clay, which could be dug out of the ground, particularly in the area around St Austell. The excavation of the clay resulted in deep pits surrounded by mountains of spoil. I remember as a child being intrigued by this almost lunar landscape in the midst of the green fields of Cornwall. They earnt the nickname, the Cornish Alps. The china clay industry is still operating, although the number of people employed is declining as the reserves diminish. There remains the issue of what do you do with a clay pit once all the clay has been extracted. One person who had a novel answer was Tim Smit. Tim is an interesting character. He once had a fairly unsuccesful career as a music performer but then rather more success as a writer and producer for other people. In 1987 he moved to Cornwall and became rather more interested in ecology and conservation. His first great project was restoring some beautiful but long neglected and overgrown gardens at Heligan. The Lost Gardens at Heligan are nowadays a major attraction. In the 1990s he came up with an even more audacious plan - to convert a disused clay pit near St Austell into a kind of giant botanical theme park, a place to celebrate the diversity of the natural world. I shall pause here to insert a video which will tell the story better than I can. The Eden Project has proved a great success, one of the most popular visitor attractions in the UK, drawing over a million visitors a year. The main feature is the two enormous biomes - like two enormouse greenhouses or conservatories. One biome is for tropical plants so it’s pretty warm and humid in there. The other has a Mediterranean climate, so lots of olive trees and sunflowers and lavender and that sort of thing. The surrounding slopes are planted with a huge variety of trees and shrubs and flowers - enough to keep a nature lover fascinated for hours. Eden also hosts a number of events including music concerts. Many of Britain’s leading pop artists have performed at Eden. The parkrun at Eden has been going for just under a year. It has proved very popular with parkrun tourists - it is one of those locations you want to have on your list! There are always a large number of visitors at each event. During the main holiday season the numbers can double or treble. It is a great way to see the Eden Project and the advantage is that it is free! (Normal entry fee, £27:50) The run starts at 9 AM so with the gates for “normal” visitors opening at 9:30, that means that most of the runners have finished or are toddling towards the finish before the crowds start to appear. The course at Eden starts beside the car park (or one of them!) then runs down into the bowl. Then there are just under three laps around the grounds. The first part of the lap is climbing back up the hill, followed by a descent down the zigzag path and then a relatively flat section along by the biomes. It is a pretty tricky course having lots of undulations and plenty of twists and turns. On the plus side it is all on smooth tarmac and you have a downhill advantage of maybe a hundred feet between start and finish. People have run some pretty decent times on this course. There were 151 starters on Saturday morning, with the weather bright and crisp and the Eden Project gleaming in the autumn sunshine. It was a slightly uphill start and then the long descent into the bowl. I got away reasonably well and was about 20th as we headed down the hill. After the long downhill the sudden uphill section at the start of each lap came as a bit of a shock. I was moving pretty well, enjoying the scenery and slowly moving up through the field. On the final lap I was looking forward to the finish though I wasn’t quite sure where it was. I was chasing two young guys and had nearly caught them when we turned a corner and there was the finish, right in front of the tropical biome. My position was 12th and my time 19:41, which was my fastest for a few weeks. It was a good place to end the parkrun as you had the café right next door, so if you had put a little money in your pocket, you could have gone in for some refreshments. I enjoyed the Eden Project parkrun very much and would recommend it to anyone who was down in Cornwall for a holiday. And you can visit one of Britain’s best visitor attractions for free! My statistics for Saturday - that was parkrun venue number 179. I managed the full set of first in my age group, first overall on age graded scores and I set a new age category course best. I shall finish, as usual, with a YouTube video of the course. Here it is - check out those hills!